LAKEVILLE, IN. 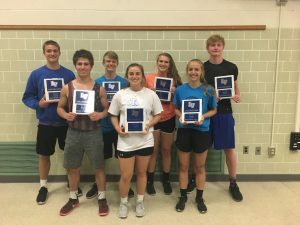 – The spring of 2018 was something to remember for the LaVille Co-Ed Track team. The Lancer tracksters recently celebrated awards recognition night. Not only did a total of 40 student-athletes participate on the Lancer team, but there was a sectional champion, regional qualifiers, and a pair of IHSAA state meet qualifiers. From the usual inclement northern Indiana weather that kept the track team indoors, to a track that was not complete due to weather and a held up construction project, to bus rides down the road to another school just to get to practice. Several student-athletes reached a personal best in their respective event throughout the season. Luke Beehler, Austin Dove, the 4 X 100 relay team of Kolby Watts, Ethan Yoder, Nick Felke, and Beehlera, along with Kalista Lemberis advanced in the state tournament. Beehler and Dove both reached the ultimate goal of participating in the IHSAA state meet. Beehler and Dove were able to accomplish something that a LaVille Boys Track team member has not done since 1996. “Luke finished 12th after jumping 22-feet, 3 1/4-inches,” said Coach Beehler. “Austin cleared 6’2” but was out of the allotted time. Dove also set the LaVille Boys Track high jump record this season when he jumped 6-feet, 5-inches at Winamac High School. The old record, set by Jeff Hartleroad in 1997, was 6-feet, 4 1/4-inches. And, during the 2018 Hoosier North Athletic Conference Championships, the 4 X 100 Relay team of Kolby Watts, Luke Beehler, Ethan Yoder, and Nick Felke broke the second school mark of the spring, sprinting to a time of 44.79 seconds. The old record, set by Ernie Hall, Jeff Tyler, Mike Ingle, and AJ Wright, was 44.8 in 1982.